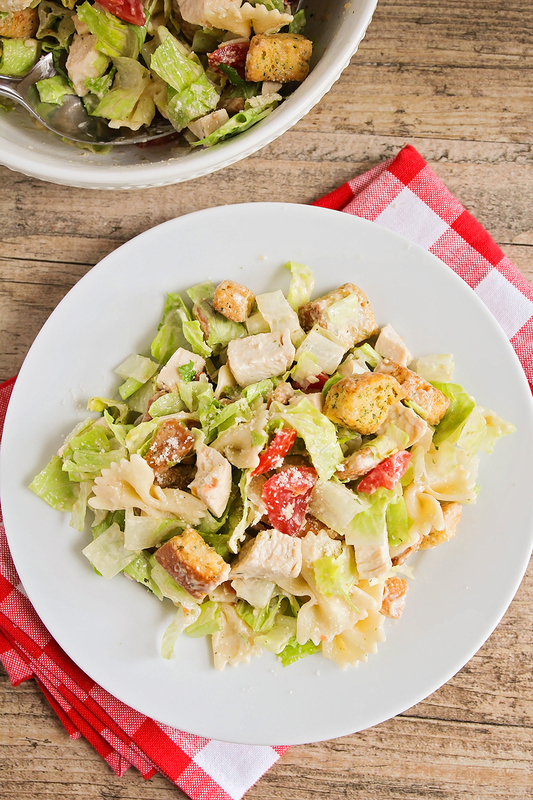 This delicious and zesty chicken caesar pasta salad is quick and easy to make, and perfect for a light summer meal! I mentioned earlier this week how excited I am for fall, but really I'm just stuck in the in-between, where half the time I want the summer to last forever, and half the time I can't wait for fall. 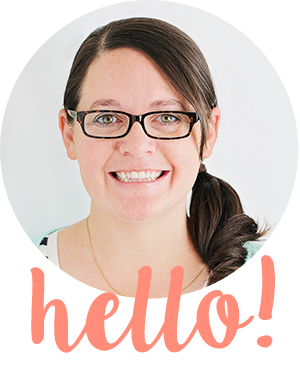 I took the kids school shopping this week and bought them new jeans and t-shirts, sparkly notebooks, and squeaky clean shoes. And I spent the whole time thinking, "Wait! Slow down! Can't we just keep hitting up the splash pad and stopping by Sonic for a slush every day? Can't we just continue to sleep in and eat lazy meals, and soak up all the sun?" All too soon, the infamous nine-month-long rainy season will be here, and I'll be remembering (with longing) all these warm summer days. With that in mind, here's a tasty and summery meal for you, even though the summer is nearly over. 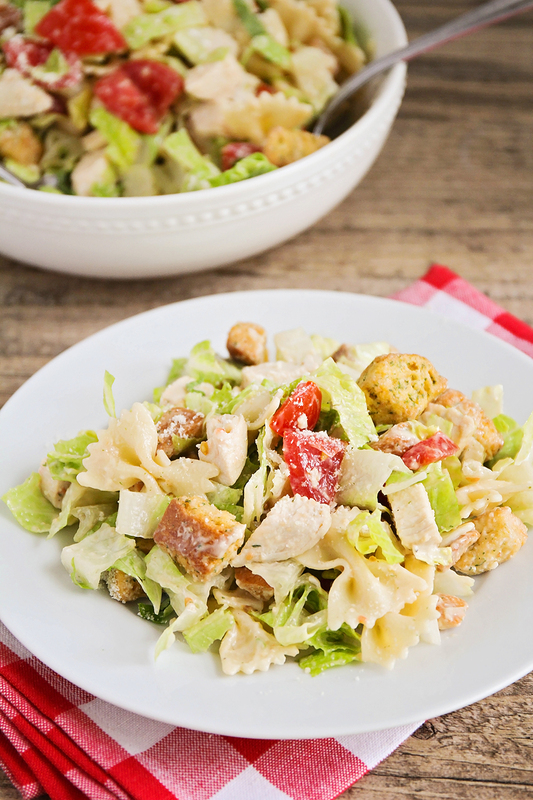 This chicken caesar pasta salad is simple and quick to make, and so delicious that you'll want to eat it all year round! 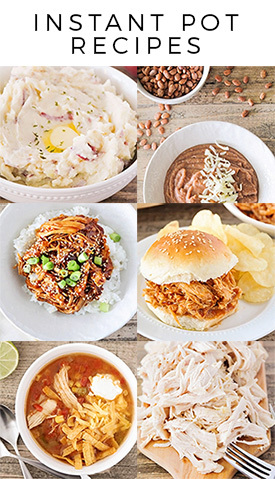 If you use a rotisserie chicken, it can be ready in just fifteen minutes or so. It's the perfect dish to bring to a barbecue or potluck, or makes for a great main course with some crusty bread on the side. This salad is a huge favorite with my kids (who ordinarily are not great fans of salad), and I love that it's so easy to make! Cook the pasta according to package directions. Drain and rinse with cool water. 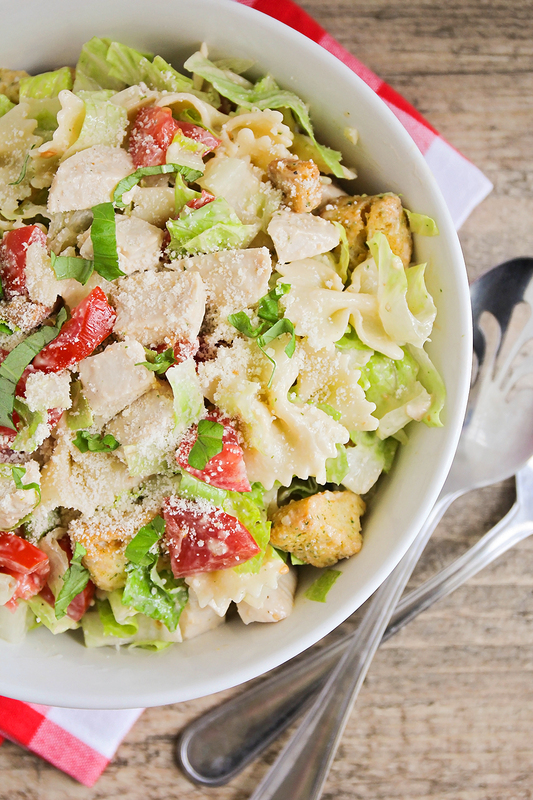 In a large bowl, combine the pasta, chicken, romaine, tomato, and croutons. Pour the dressing over the top and toss to combine. Sprinkle with parmesan cheese and fresh basil. If you’re making the salad in advance, add the dressing just before serving.